Thanks Jake, a good read. You only need to attend mid- week house matches to understand the passion, commitment and tradition! It does again emphasize just how sad the current state of affairs are with WP rugby. How is it that you can have three great rugby producing varsities on your door step and still manage to balls things up. With the resources in such close proximity WP should be unstoppable- the administrators have much to answer for! Run like an amateur club? Lack of real ‘professional’ leadership and management? Resonate with most RSA unions? Somewhat out of touch? Too many Ikeys and ex-Ikeys in the WP set-up. Some very iffy players being contracted. Just have a look at the WP Currie Cup side and rugby challange side. Can we assume a Stellies man then, perhaps? I think Jake is eluding to building a winning culture and as Jake will know, better than most, this is extremely difficult in SA. Winning the WC was the perfect platform to build continuity for the next 4 years but SARU, in their infinite wisdom, did not renew his contract and hired PDivy. Rassie was appointed on a 6 year contract to do exactly this and was under pressure to survive after 4 or 5 games! Here we have a, generally, poor media, provincialism (a good example is the bleating on this site when a favorite Shark, Lions player is not picked) and then of course we have ANC politicians telling the coach who they can and cannot pick. Maties have none of these problems and 100 years of tradition behind them. Well John would you not bleat when your favourite WP player is not chosen over a journey man player? When some damn good players from a side that just chopped WP in the CC final (deride the competition if you feel) yet some WP players not deserving go on Bok tour? Provincialism is alive and well…..
And what did Pdivvy do wrong ? He beat the Allblacks in their own backyard and got robbed at the World Cup? He won the British and Irish Lions too ? 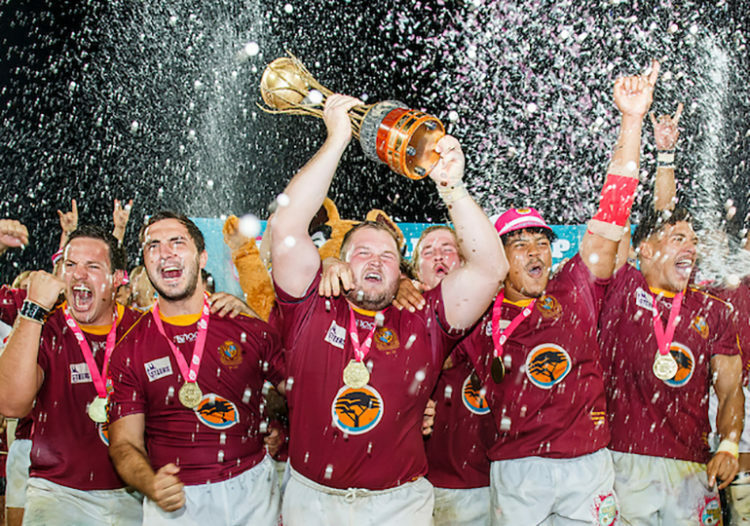 Maties also have a have politics involved, they have Varsity cup rules enforced to them to play with a certain amount of players aswell! Don’t use our countries politics and history as an excuse! Hello Jake rugby is like Family, like Business you can only build on a good foundation laid with the intention of ages to come. To look good for a short while is possible but not sustainable. I watch rugby and see two things 1) the Scrums collapse out of sheer pressure from the big players behind the front row. It is extremely dangerous and tiring so much so that teams need replacement front rows for each game. The solution will be that nrs 6 and 7 do not engage in the scrums and take their places behind nr 10. That will take 4 players out of the scrum and relieve the pressure making the scrum safe and bearable for the front row. It will also make the game faster and more exciting to watch. If this is implemented and satisfies the rugby world then it is a step forward. 2) The 2nd aspect that i as a viewer has noticed is the players have developed such rugby skills that the rugby field is well covered making it difficult for players to breakthrough the defence. That leads to many rucks and mauls and i get tired of watching this over crowded rugby. What could solve the problem is to have nrs 6, 7 and 8 rotate on the nr 8 position. Yes i do mean that we play with 13 players on the field that would make the front row safer, the game faster and breath life in to the game of rugby. The front row can now be lighter and more agile. Players, Supporters and Viewers will enjoy a game of skill and pace making Rugby Great again. It would make it safer for the front row but would take away all the space as there would be extra bodies in and around the backline. I think the law should change to force all eight forwards to engage in the scrum and lineout. This would create more space for the backline to attack as it would basically be 7 versus 7 from first phase ball. They should also police the offside line more aggressively. How would adding 4 more loose fwds to the backlines lead to less rucks or not overcrowd the backline ? Aslo fail to see how that would enable more backs to break the defensive line after a set play. At the risk of getting repetitive, I will tell you the problem. On second thought, never mind. Getting soft Sweet, off colour perhaps? Nahh, just don’t have the patience anymore, -and some people just refuse to see the wood for the trees as evidenced already by some “Ikey” fanboy. I will tell you this though, I went to Affies when the culture Jake speaks off was prevalent and my wife went to Potch Girls High. Both schools historically had the culture Jake speaks of, my daughter went to Potch because her mother was an old girl and nowadays it’s more like a zoo and everything is in chaos, so it’s quite apparent that institutions which have maintained their cultures remain successful whilst the more “integrated” ones descend into chaos. You only have to broaden your view to Eksdom, Transnet, SABC, SAP, SANDF and the SPRINGBOKS to see the exact same chaos. An old saying springs to mind, you can mix Shyte and ice cream and the shyte remains unaffected, but it sure as hell stuffs up the ice cream. Gee whiz, SweetAz, sounds like you’re going through menopause. Strength brother the sun will come up tomorrow. Cheers. Still rather be me than you. You make some good points, Jake. I’ve always been an adamant supporter of promoting from the ground up. The coaching staff of successful Varsity Cup teams needs to have some serious backing and even promoted to further levels. This can only lead to success. Imagine if all the Super Rugby coaches have that winning pedigree on some level, be it at varsity level or junior level? Perish the thought. Jake you just jinked Maties. Tuks is going to win them this year. Professionalism. When people play for money – that’s the issue. (Somehow NZ have found a balance) When pplayers play because they want to play for their team = real passion. Danie Craven is spinning in his grave. Super Rugby is dead, Rugby Championship is Dead, and we have murdered the Currie Cup in the quest for more money.